HOMER: As Gabriel Kehn clung to cliff, his girlfriend, Bethany Lynn, slipped away. Homer -- A young couple, close to death from hypothermia, were trapped beneath a sea cliff on an island in Kachemak Bay last week after their kayak flipped in strong gusts. Bethany Lynn, 26, died on the rocks later that night and was swept to sea by the tide. Her longtime boyfriend, Gabriel Kehn, also 26, managed to climb the cliff before collapsing. He survived on the small deserted island for three days with severe frostbite before a passing boater saw him waving from a rocky promontory. Kehn was rescued Saturday and taken to South Peninsula Hospital in Homer. He was listed in stable condition Monday. Doctors said he might have to remain a month because of frostbite. On Monday, Kehn lay in his hospital bed with black swollen feet and wiped away tears as he described how his girlfriend fell irretrievably asleep on the rocks. He remained with her until the incoming tide lapped at their bare feet. "I didn't know what to do. I was so confused and disoriented myself," Kehn said. "I keep going through it now in my brain, wondering what I could have done." Alaska State Troopers called off a brief helicopter search for Lynn's body Saturday because three days had passed since the accident. "Her family was OK with that," trooper Rick Roberts said. "They understand that's the way it works up in Alaska sometimes." Friends have searched since Saturday with skiffs and a diver, said Tom Hopkins, who runs the Jakolof Ferry Service. He said Lynn was well-loved, a "vivacious young gal in the prime of her life." Hopkins called the island where they washed up "a miserable piece of real estate," almost entirely encircled by cliffs. The night of the accident, he said, gale winds and rain pounded down from the mountains. "I was never so glad to get home, and it was the same night they were fighting for their lives. I went right by the island on the other side and never knew," he said. The trooper said Kehn's account of the accident checked out -- both the physical details and the emotional timbre of his retelling. According to Kehn, Tutka Bay was calm Wednesday morning, enticing them into their blue-and-white kayak for a rare winter's day trip. They were experienced, having kayaked as far as Homer, about nine miles away, last summer. 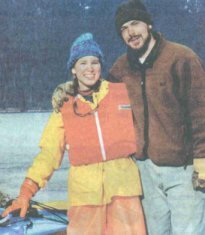 Lynn and Kehn were in the midst of their second winter caretaking the Tutka Bay Lodge on the south shore of Kachemak Bay. They had come to Alaska in 1999 from Idaho. The couple had been together five years and felt they were married, Kehn said, though they'd "never officialized it." Kehn was writing a book at the lodge. Lynn was learning to paint. "We were trying to get away from the hecticness of life," he said. The wind came up suddenly Wednesday. They turned back and attempted to cross the mouth of the bay to the lodge, several miles away. Powerful gusts forced them to point instead toward the head of the bay. Tiring, they decided to turn around and let the wind push them ashore on Casey Island, which lay just behind them. As they turned broadside to the wind, a wave rolled their kayak upside down. The two slid into 40-degree water. They kicked off their boots to keep from sinking. The 175-pound Kehn helped his 115-pound girlfriend into the half-submerged kayak, but it rolled over again. "I could tell it affected her right away more than me," he said. They held onto the sides and drifted toward the rocky island. "She kept asking me, Are we going to die?' I didn't think we were. I thought we were going to make it. The island was so close." They had to let go and swim for the rocks as the kayak drifted past. The swim was tougher than he expected -- he gulped salt water, waves crashing over his head. He saw Lynn splashing wildly, frightened. He yelled for her to keep moving. They reached an exposed rock and hung on with their fingers, still dangling in the water. Maybe 30 minutes had passed. Time was hard to keep track of. Finally they pulled themselves up and passed out. The tide was dropping. A rib of jagged rocks, only a little submerged, led to the main island. They stumbled across, their socks ripped to shreds, and found a nook in the rocks at the base of a 20-foot cliff. "We felt we had survived. We just collapsed with exhaustion," he said. Hypothermia confused them, he said. They should have pushed on. Instead they woke up and it was dark. From a small dry bag, Kehn pulled a headlamp and a lighter. With numb fingers and feet, he fell several times from the rocks before he managed to reach the top of the cliff. He collapsed again, then roused himself to try to make a fire. The grass and sticks were wet, and his fingers couldn't work the lighter. When he climbed back down, Lynn was staring blankly into the light of the headlamp. He wrestled with her, slipping and falling, pushing her up the cliff, until she grabbed onto a dead tree about halfway up. She clung to it, then let go. They both slipped to the bottom. After that, she was limp and couldn't be budged. Kehn climbed up again, trying again to light a fire, thinking it would entice her up. Again he failed. When he came back down, Lynn was asleep. His headlamp was growing dim. He shook her and yelled at her but couldn't get a reaction. Finally he stopped. "There was a part of me that felt she was dead," he said. "I kind of gave her a kiss. I knew that would be it." The light from his lamp faded out. He sat beside her in the darkness until the tide reached their perch. Then he climbed back up the cliff and gave up. He awoke in daylight and couldn't stand. He peered over the edge of the cliff. The rocks below were bare. Kehn stumbled, sometimes walking on his knees, toward a small cabin he'd seen on the island last summer. Inside he found a little water and a plastic bottle of ginger ale. His feet were starting to bleed and burn with pain. For three days Kehn stumped out to rocky points, once wrapping his frozen feet in towels and duct tape. He carried a red curtain from a cabin cupboard. Several boats passed, but no one saw him waving. The weather was turning colder, temperatures dropping. He started looking at the water and "head-tripping," he said. "There's a part of me that just wanted to jump back in the water because I didn't want her to be alone," he said. "She kept saying, Let's stick together.' I didn't want to let her down." Then he saw a speck on the horizon: a skiff, coming from Homer. He grabbed the curtain and hobbled out to the nearest rocky point. Steve Ebbert of Anchor Point still isn't sure why he headed through Tutka on Saturday for a recreational run. He spotted an unfamiliar aid to navigation on Casey Island and turned. "He kept coming," Kehn said. "That was the first time I started bawling and my emotions came out, because I knew I was going to make it, and if Bethany had been with me, she'd have made it too." Reporter Tom Kizzia can be reached at tkizzia@adn.com or at 1-907-235-4244. Friends still prowl the passes and rocky coves of Kachemak Bay, watching for the yellow rain jacket Bethany Lynn wore when she died of the cold and her body was swept off a cliff by the tide. Across the bay in Homer, her boyfriend, Gabriel Kehn, lies in a hospital bed, slowly recovering from frostbite and hypothermia after his three-day survival ordeal.